26-year-old Slumdog Millionaire actress Freida Pinto hails from the great sea-side city of Mumbai, hub of the Indian entertainment industry and home to Bollywood. So perhaps it's a little ironic that Pinto, who has quickly become one of Hollywood's hot young stars, hasn't yet received any major Bollywood offers. Since Slumdog, Freida has starred in Woody Allen's You Will Meet A Tall Dark Stranger, alongside big-name stars like Naomi Watts, Josh Brolin, Anthony Hopkins and Antonio Banderas, and starred in the politically-charged film Miral. She will soon appear in Tarsem Singh's new movie Immortals, alongside The Wrestler star Mickey Rourke, Twilight star Kellan Lutz and English actor Henry Cavill. At one point, there were even rumours that Freida would star opposite Daniel Craig in the next James Bond movie! All of that, and she's still yet to sign a Hindi-language project. In a wide-ranging interview with The New York Times Style Magazine Women's September edition -- she's also pictured on the cover, looking gorgeous -- Pinto opened up on her future career plans and her love life, and gave a little peak into the Hollywood/Bollwood gulf. "I have done no film in India so it is very hard for people to accept me as an actress. They don't really know who I am or they probably don't take me too seriously," PTI reported Pinto as telling the New York Times. I am not famous in India. I don't get chased around," she said. 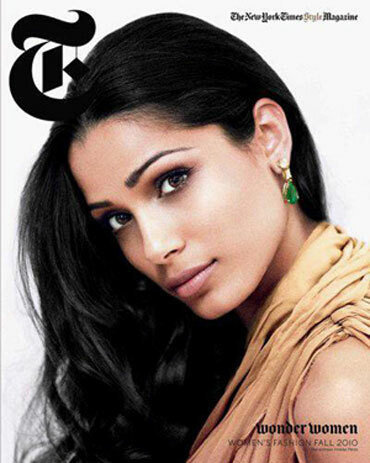 In response to Pinto's NYT photo-shoot, film critic Anupama Chopra, perhaps alluding to Bollywood's snub of the once-obscure model, wrote on Twitter: "Stunning pics of Freida Pinto in NYT reminded me of remark made by envious actress, shocked at Pinto's ascent: 'But she's from Malad!'" In the interview, Pinto also discussed her controversial break-up with fiancee Rohan Antao, whom she dumped before becoming romantically linked with Slumdog co-star Dev Patel. "I feel what I did was right. There were no two ways about it," she said. "Everyone is going to write you off for one thing or another, but you know what? It's my life, and if I didn't go through it, I wouldn't be the person I am today, sitting here talking about what happened back then and being a little more knowledgeable about what happens in relationships." For the past few months, rumours have cropped up suggesting an impending wedding date for Patel and Pinto, but thus far both camps have denied the gossip.